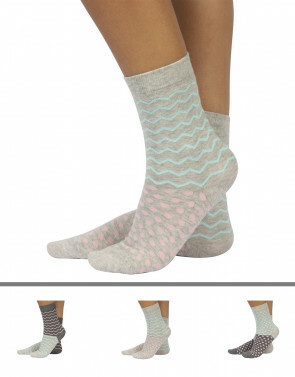 In the Variegated World of Women's Socks Choose Quality! Coloured or in solid colours, in cotton, sheer or in the microfibre...the world of women stockings and socks offers a multitude of possibilities for every occasion and every age. In our store, there is a wide range of online socks made with carefully selected and high-quality yarns, from the prized Lycra to soft microfibre but also cotton. Our women's socks are designed to provide the necessary comfort throughout the day and in all daily activities, from work to leisure, from sports to evening events. Comfort is a fundamental aspect for us at Calzitaly, but we cannot forget that looks also count, and this also applies to hosiery. That's why for our collection of stockings for women and socks we have chosen sparkling and fashionable designs and patterns, such as stripes, small and large polka dots, embroidery, woven effects and much more. The Right Socks For Every Season. Our assortment of online socks includes models suitable for all seasons. Perfect for the summer season, for example, are ankle socks, shoe liners but also socks that are a little longer, which can be seen under jeans and that give a touch of contemporary and fun to even the most formal outfits. For the autumn or spring, our wide and colourful assortment offers, in addition to stockings, also women's knee socks made of different materials, from LYCRA to the heavier microfibre, to guarantee style and maximum comfort in all weather conditions. Find out more about our wide range of products: on our website, you can find stockings for women, ankle socks and knee-high socks for all styles and needs. Choose your favourite model right away. A Wide Choice Of Knee Highs Online. In this section, we have women's shoe liners, colourful ankle socks, high-quality socks but also various models of women's knee-high socks. These are not only trendy accessories, but also very useful supports. The vast assortment includes, for example, women's knee-high socks with massaging insole, designed to give well-being to the legs and feet even when wearing high heels. In addition to knee-high socks and ankle socks, in this section of Calzitaly's online store, you can also find a large assortment of over knee socks, a model of stockings ideal for the colder seasons. You are spoilt for choice as far as materials and types are concerned even in this collection: you can choose, in fact, between microfibre or cotton, choose a sheer model or something more opaque, opt for open-knit embroidery and so on. The sale of women's socks has never been so lively! Take a look at the entire collection of women's stockings, ankle socks, shoe liners and knee-high socks online.